Stabila LAX 300 Cross Line Laser Level with plumb points - the brilliant time-saving tool for simultaneously marking out floors, walls and ceilings! The LAX 300 allows the user to create multiple laser lines from one position and enables the operator to work directly on the laser beam. Not only does this save time and effort, it also greatly reduces the chance of making measurement errors. This really is a must have item for electricians, drywall builders, fitters, plumbers and tilers! Features one horizontal line, one vertical line and a plumb-line that points both upwards and downwards. Produces narrow laser lines that are easily visible up to a range of 20m. Allows the user to work directly on the laser beam which greatly decreases the risk of making transfer errors. Self-levelling range of ± 4.5° and a levelling accuracy of up to ±0.3 mm/m. 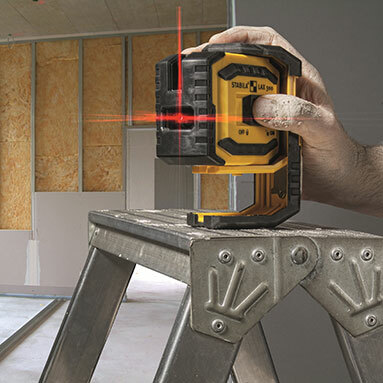 This laser level can be rotated 360° in its own housing. Can be used directly on the floor, on a tripod (1/4" thread) or attached magnetically to metal objects such as studs and girders. Shock-absorbent soft grip casing with IP54 protection against dust, and water splashes. Over 20 hours of use from 3 AA 1.5v batteries. Suitable for outdoor use when combined with the Stabila REC 210 line receiver (available separately) with a range of up to 250m. Includes: Stabila LAX 300 cross line laser level, target plate, wall bracket, belt pouch and 3 x AA 1.5v batteries.